Your prime source for Destin Florida vacation rental homes, and Destin beach rentals information. See the beaches even Floridians drive hundreds of miles to see. Destin and Destin area beaches from Holiday Isle to Inlet Beach, vacation beach houses, vacation beach condos, and Destin real estate sales info See all of the fun things you can do in Destin! Long before Destin became popular as a beach resort, it was famous for the great fishing in the Gulf Of Mexico. The continental shelf, where much of the action occurs, can be reached in minutes by the local charter fleet. Many other places are so far from the continental shelf that half your trip is spent traveling to the fishing spot. Fishing is still great here, and the local charter boat operators know where the action is! 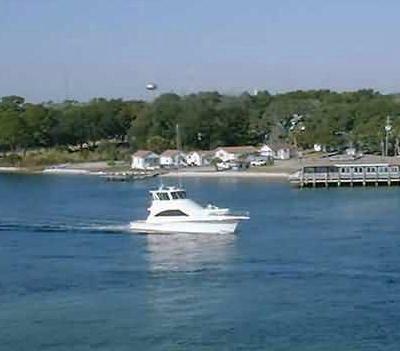 Destin is one of the best places to fish on the emerald coast. The continental shelf is just offshore. Some of the other fishing ports are over 20 miles from the continental shelf, and good fishing. The ride to the fishing grounds can use up half of your trip. That's why the local skippers can offer half day trips, at reduced prices, they don't have that long trip offshore to contend with. Our crews are the best and friendliest on the gulf coast. It doesn't matter if you have never fished before, they will help you and give you friendly advice to get you started. You will enjoy your vacation here, and we hope you can take some great photos home with you. Copyright © Destin Adventure All rights reserved.